The Forged Espanola Wrought Iron Buffet Hutch exhibits a beautifully contrasting design with the use of hand-scrolled iron and solid old wood. The contrasting goes beyond the use of materials by contrasting the color of the honey stained wood to the naturally rusted iron scrolls. This Espanola Buffet a versatile piece with the use of ball-bearing railed drawers and built-in sheves on each side, making it a perfect accent piece. 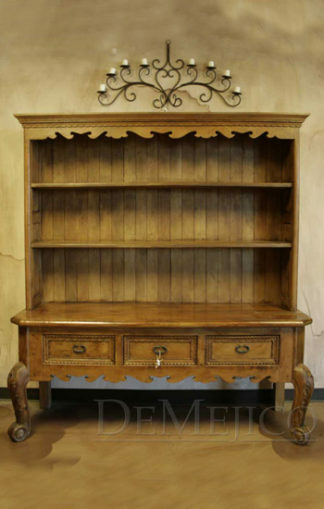 Ask us how we can tailor the Espanola Buffet to fit your storage and design needs.